News, HYDERABAD: A case was registered against a man for allegedly firing in the air during his marriage ceremony in Falaknuma area here, police said on Sunday. 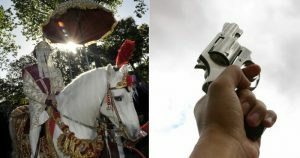 Riding a horse during his marriage procession, the bridegroom fired ten shots in the air from two revolvers as a mark of celebration of his marriage. According to the reports, the incident has occurred on August 22, the video which shows the bridegroom firing ten rounds of ammunition in the air has been widely circulated on social media, on Sunday. Based on the video footage, the Falaknuma police registered cases under Arms Act and took up the investigation. Irfan, the over enthusiastic bridegroom, got married on August 22. As the marriage procession reached the venue, Irfan started the celebratory firing using two weapons while his family members and friends were seen dancing wielding swords and daggers. However, hours after the video went viral on social media, Irfan surrendered before the police on Sunday. Assistant Commissioner of Police (Falaknuma Division) Mohd Abdul Bari said that Mohd Mohsin alias Irfan surrendered before the police and handed over two “dummy” weapons and four bullets. Police lodged a case under the Arms Act on Sunday after the incident, which took place on August 22, came to light. “He confessed that he had opened fire in the air from two dummy weapons during the celebration of his nikah on the night of August 22 and the weapons caused only sound and spark,” the ACP said. Irfan told police that a film producer had given him the dummy revolver and pistol with some bullets. Local news-channels had aired footage of a bridegroom on horseback firing in the air. “Both the weapons appear to be a dummy. But we are sending the weapons, bullets and the video footage to FSL,” said ACP Bari.